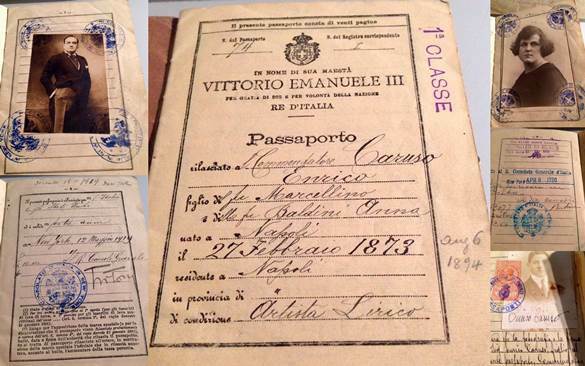 What a significant finding is this Italian passport of Caruso from 1919 issued in New York! His travel document included his 2nd wife Dorothy Park Benjamin (the daughter of a wealthy New York patent lawyer) and his son Enrico, Jr. (from his 1st wife, Ada Giachetti). This passport is a museums piece! A fastidious dresser, Caruso took two baths a day and liked good Italian food and pleasant company. He forged a particularly close bond with his Met and Covent Garden colleague Antonio Scotti – an amiable and stylish baritone from Naples. Caruso was superstitious and habitually carried good-luck charms with him when he sang. He played cards for relaxation and sketched friends, other singers, and musicians. Dorothy Caruso said that by the time she knew him, her husband’s favorite hobby was compiling scrapbooks. He also amassed a valuable collection of rare postage stamps, coins, watches, and antique snuffboxes. Caruso was a heavy smoker of strong Egyptian cigarettes, too. Enrico Caruso; (February 25, 1873 – August 2, 1921) was an Italian operatic tenor. He sang to great acclaim at the major opera houses of Europe and the Americas, appearing in a wide variety of roles from the Italian and French repertoires that ranged from the lyric to the dramatic. Caruso also made approximately 290 commercially released recordings from 1902 to 1920. Caruso’s 25-year career, stretching from 1895 to 1920, included 863 appearances at the New York Metropolitan Opera before he died at the age of 48. Thanks in part to his tremendously popular phonograph records, Caruso was one of the most famous personalities of his day, and his fame has endured to the present. He was one of the first examples of a global media celebrity. The document was offered to me via my website for an extremely (unrealistic) price. I’ve watched this Caruso passport on EBay for quite sometime a few years ago and made the previous owner a good offer but unfortunately couldn’t compete with his asking price. I literally cried when I saw it sold. Caruso is my favorite singer ever and I so much would have loved to own it. If you ever think about reselling it please don’t sell to someone else but consider me please. I would cherish it forever. I have several signed photos of him as well as his diary ( I believe it to be genuine) from ca. 1898 which I treasure very much. Thank you Tom and best of luck to you.